The lights! The noise! The colors! We’re out shopping. It’s a normal store. Normal enough. Clothes on racks. Hats on display. Maybe a kimono or two draped on a mannequin, but other than the signs posted in Japanese, the store could almost be mistaken for one located behind a massive parking lot on the edge of pretty much every American suburb. But then something weird happens. Turn a corner and an entire section is pulsating with tinny, high-pitched music and cheerful carnival-like bells and whistles. There are rows and rows of machines creating a cacophony of sound, beckoning shoppers (gamblers? kids? teens?) to play. It’s not just an arcade of video games. 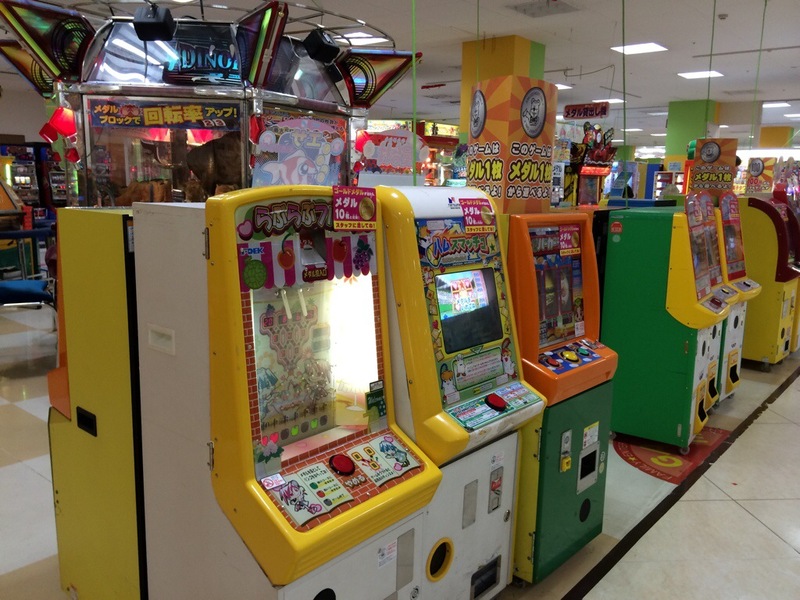 Some of the machines have screens revealing complicated cartoon videos of action heroes engaging in battle or saucer-eyed, pink- and blue-haired girls in short skirts dancing robotically to pop songs. 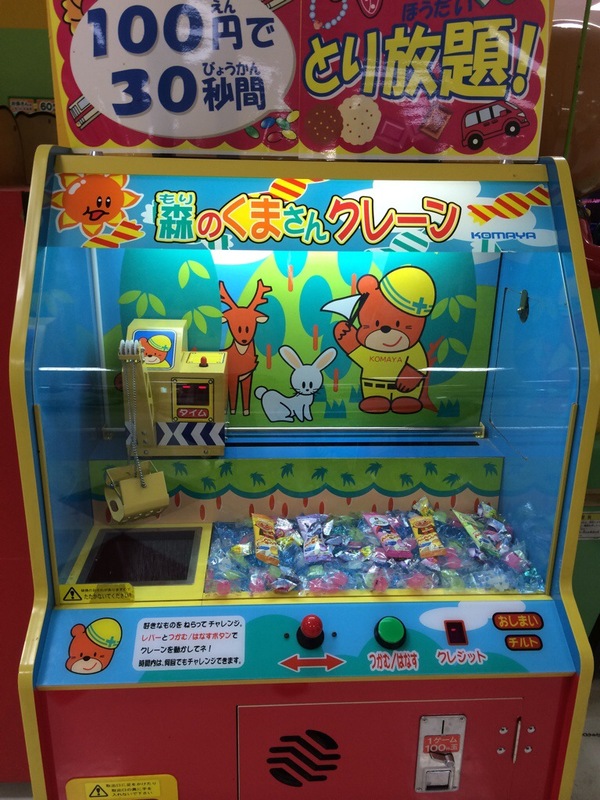 There are also mechanical games, the ones with the big claw you can almost never make grab the stuffed animals lined up inside the clear box or the marbles which have to follow complicated arcs and turns to finally find rest. Slot machines beckon, with tiny stools in front. If someone is seated there, he’s usually a slight, elderly, Japanese man, engrossed in his game. Neither are American children. In fact, they embrace light and noise and color. Every time we’ve encountered one of these play areas, Liam has yanked hard on my arm, dragging me in to these modern mazes. The first one we found was two weeks ago on the top floor of the Seiyu, the Japanese Wal-Mart that occupies a block of downtown Fussa. We emerged from an escalator to find ourselves facing one of these play areas. 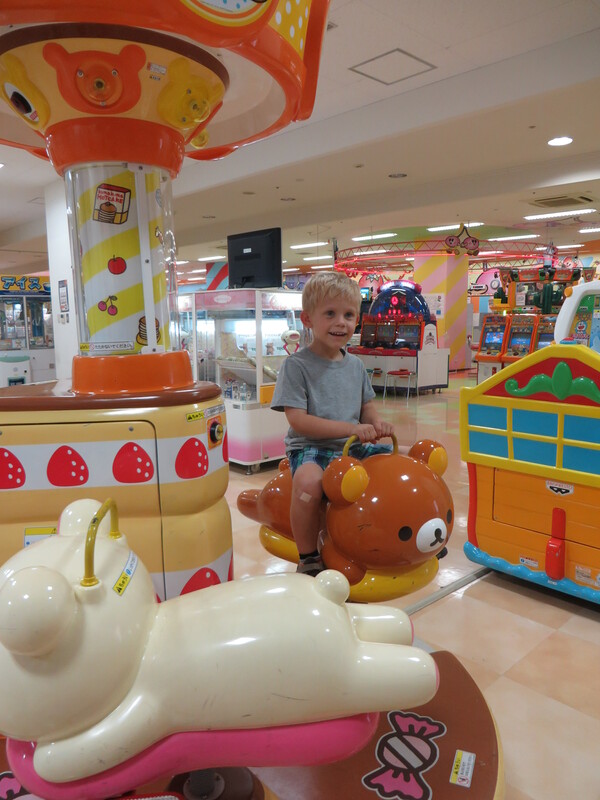 Jet-lagged and still a little shell-shocked, I dug out a 100 yen coin and let him take a spin on a strawberry- and teddy bear-themed mini merry-go-round. It’s the last money I’ve had to spend. He’s too little to realize he’s not really playing any of the games. They gurgle and shout and wink at him regardless of tokens or cash; he’s just as happy to hit their red and blue buttons with no obvious response. Today, we visited the Daiei store in Fussa with a friend, L, who also just moved here from Dayton. We did a little browsing in the grocery and house wares portion of the store, but the real show came once we took the elevator upstairs. Like Liam, her two small children were entranced by the arcade play area. For an hour or so, we watched the kids skitter from machine to machine. Perhaps we should have worried about overstimulation – or seizures! 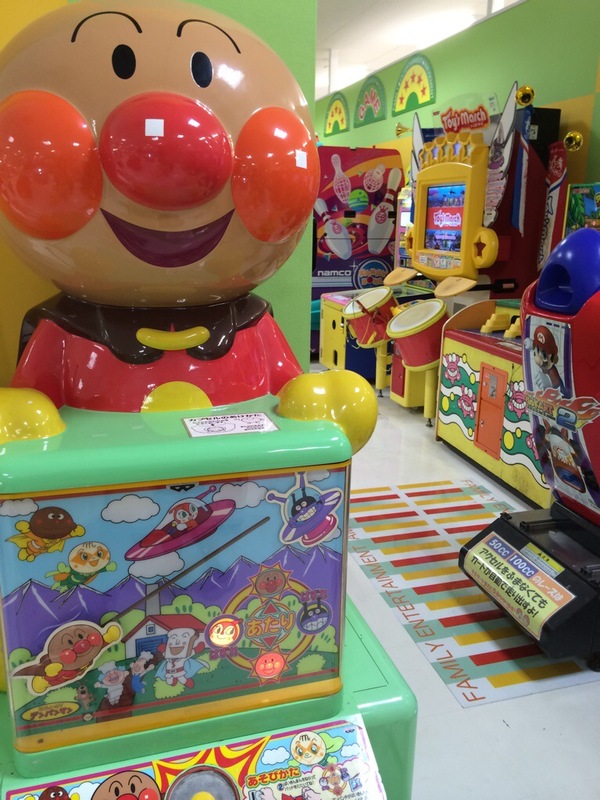 – but it was so much fun watching how delighted the kids were by the arcade. 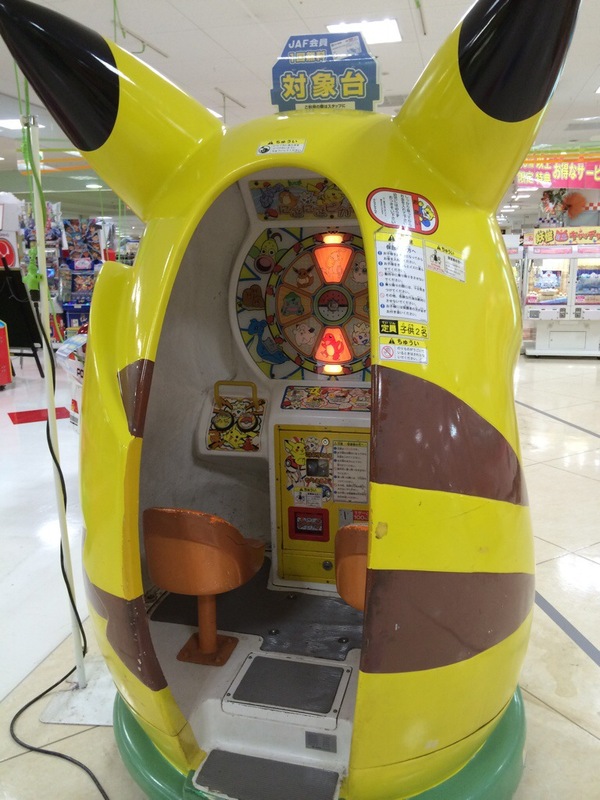 Only hunger and the promise of lunch gave us suitable fodder for enticing them away from a giant yellow Pokémon character big enough for two small children to sit inside. You took a picture of Anpanman. He meant so much to my kids when they were little (and most kids in Japan since the ’80s) . A superhero whose head is made of a sweet-bean filled bun? How wonderful! Thanks for sharing! Yes, he’s very popular here. I’m sure you’ll begin to notice his image on many kids’ toys and clothes here.